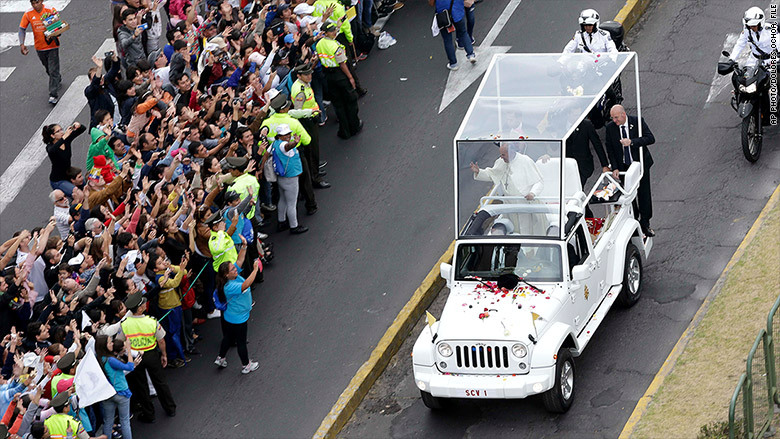 When visiting the United States, Pope Francis will ride in a modified Jeep Wrangler like this one that he rode in while visiting Ecuador. When crowds throng to see Pope Francis during his visit to the United States next month, he'll be riding high in an American-made Jeep. The Vatican confirmed to CNNMoney that the pope would be riding in a modified Jeep Wrangler. Wranglers, built in a Fiat Chrysler (FCAM) factory in Toledo, Ohio, are famously easy to customize and this one will likely sport a few modifications for its life as a Popemobile. Unlike past pontiffs, who have ridden behind bulletproof glass in modified Mercedes-Benz SUVs, Pope Francis eschews both extra security and excessive luxury. Pope Francis has said in the past that he prefers to take his chances rather than separate himself from his flock. Taking after St. Francis of Assisi, who was known for self-imposed poverty, Pope Francis has mostly ridden in non-luxury vehicles from such automakers as Kia and Ford (F). He's ridden in a Wrangler before. He rode in the back of one while visiting Ecuador. That white-painted Jeep had an added railing and a tall windscreen that allowed Pope Francis to stand upright to greet the crowds. As a tall open-topped vehicle with ample backseat space, the Jeep Wrangler Unlimited would be particularly well-suited to this sort of use. The Vatican did not say what sort of modifications have been made to the Jeep the pope will ride in in the U.S.
Jeep's parent company, Fiat Chrysler Automobiles, has refused to comment on the matter, referring all questions to the Vatican.